The taste and the health benefits of Olive Oil and Balsamic Vinegar have been enjoyed for generations. Our authentic Chic Chef Balsamic Vinegar is made from specific Italian grapes that have been aged for at least 12 years in wooden barrels. The result is vinegar which is dark, thick, slightly sweet. Our authentic Olive Oil is made from Italian olives pressed to perfection. Our products are infused with the freshest seasonal ingredients to be enjoyed by all. Balsamic vinegar and olive oil both contain plant-based antioxidants called polyphenols. This antioxidant helps to prevent inflammation, lower blood pressure and may inhibit the formation of blood clots that cause hardening of the arteries, according to a study published in "Journal of Nutritional Science and Vitaminology." Both provide healthy fats which our bodies need. In addition balsamic vinegar has proven to lower blood sugar and may reduce Type 2 diabetes. Flavorful Olive Oils and Balsamic Vinegars are used to prepare many dishes. Whether the oil is used over vegetables, used in a stir fry, drizzled over a baking chicken, used as a marinade for seafood or as a glaze for carrots.. your palette and your health will thank you! Exquisite flavor – made from only the finest ingredients from Italy. Superior quality that has inspired amateur & professional cooking enthusiasts, like you, to create delicious meals for family and friends. 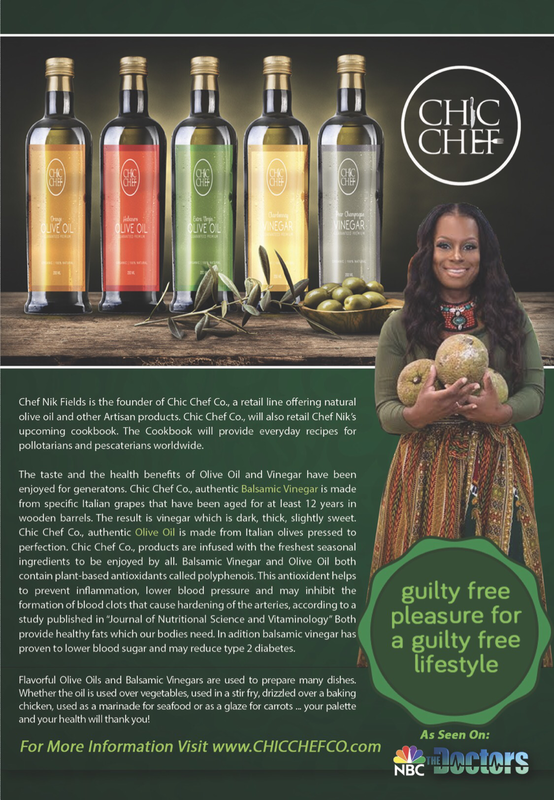 The Chic Chef Artisan Products are the brainchild of Celebrity Chef Nik Fields. Nik Fields, an experienced Chef and a true foodie, searched for a quality product to be offered to other food enthusiasts. Great-tasting olive oil and balsamic vinegars are the base or the dressing of many things we eat. As the health benefits and versatility of olive oil become more widely known, The Chic Chef Company looks forward to sharing our passion with food lovers everywhere.